Many years ago I taught at a college in Newport Rhode Island. The academic building was located on the cliff walk next to the famous summer “cottage” of the Vanderbilts known as The Breakers. Many times I would arrive just after sunrise and the entire school and all the mansions would be completely socked in by fog. A fog horn moaned in the distance. This morning as I rolled out of my driveway I had a flashback to my Newport days. I can’t remember it ever being so foggy here in DC. I could not make out the main road that is only 50 yards from my driveway. I stopped to take a picture. The pickup truck is parked at the corner. The illuminated street light is on the opposite side of the main road. I forged onward totally paranoid that the car drivers would not be able to see me. To add to the peril, the fog condensed on my glasses making it even more difficult for me to see. Fortunately, they were being careful and my route for the most part is on quiet side streets. I figured by the time I reached the river the fog would have lifted. I figured wrong. 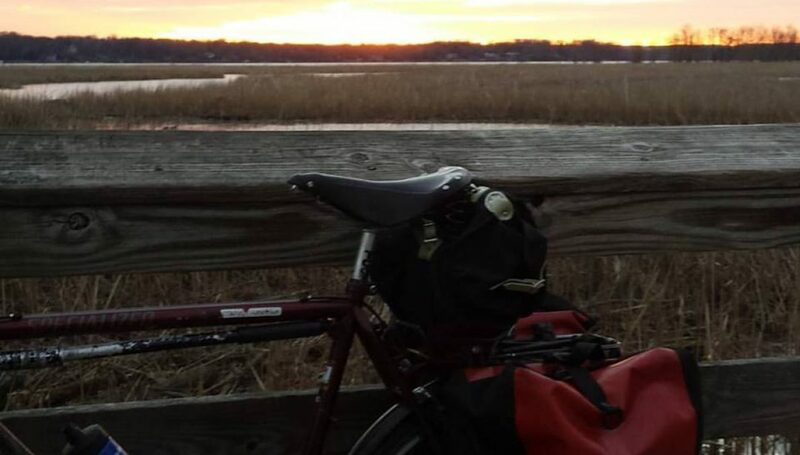 Readers of this blog will know that I take sunrise pictures from a bump out in the wooden bridge that carries the Mount Vernon Trail over Dyke Marsh. Here’s today’s sunrise. The ride to work along the trail was safe but spooky. The regulars were out. The hoppy runner. The mom pushing what must now be a 1 1/2 year old in a jogging stroller. If she keeps this up, she’ll be She Hulk in a few years. I looked to see if there were bald eagles in the tree at the Belle Haven nest. I couldn’t see the tree. I was really looking forward to the ride home because the temperature was in the high 50s. That’s pretty sweet for January in DC. Then I rolled out of the garage and was treated to a nice surprise. Sunlight. It was still light out. Are you kidding me? Yes! And it stayed light out for 15 minutes. Bike commuting in winter does have its moments. Posted on January 18, 2017 January 18, 2017 by rootchopperPosted in #bikedc, Dyke Marsh, Mount Vernon Trail, winterTagged "Mount Vernon Trail", bike commute, Dyke Marsh, fog, winter. That’s some thick fog! I love fog, it is something we have often in Washington.